Adding appointment booking capabilities to your website is essential to bringing your online visitors to your storefront and converting them into customers. 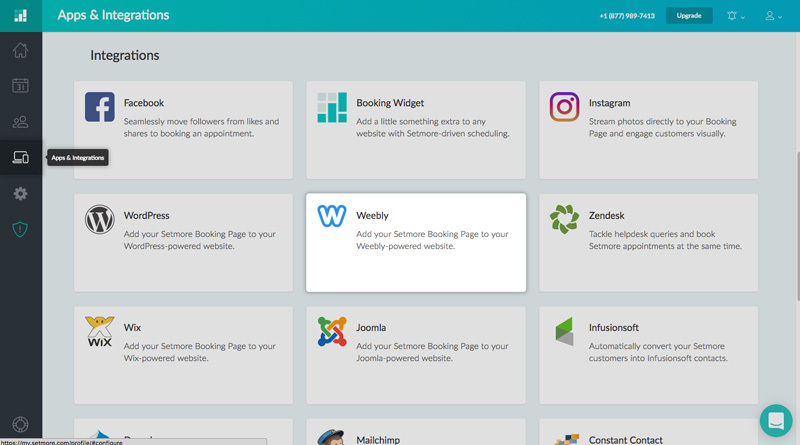 If you built your website using Weebly, then you'll be pleased to know that Setmore offers a way to add a "Book Appointment" button in just a few steps, no coding experience required. This button, when clicked by a customer, will open your Setmore Booking Page directly on your website in a lightbox or a new browser tab (your choice). Customers may then proceed to book an appointment with your business, as usual. 1. 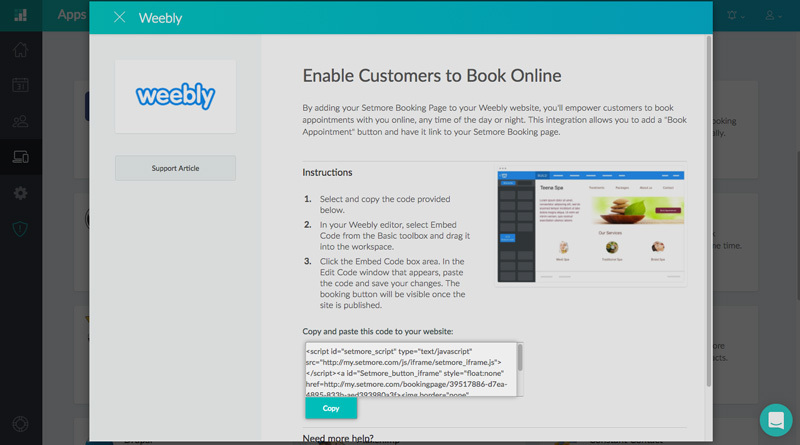 In Setmore, navigate to Apps & Integrations, scroll down and click the "Weebly" card. 2. Beneath the grey box of HTML code, click the "Copy" button. 3. 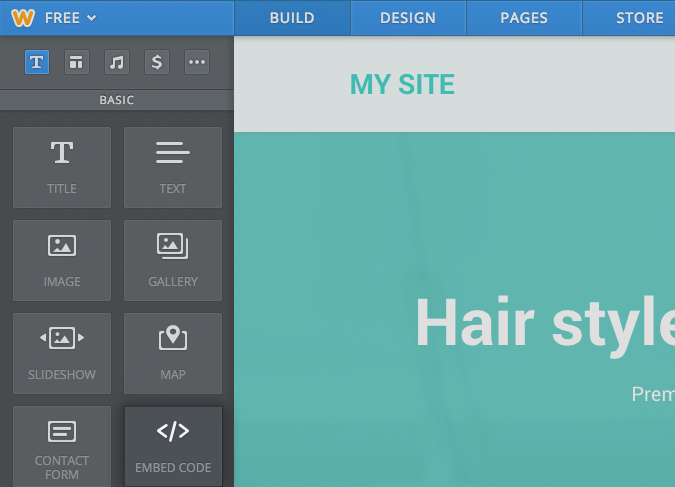 Now open your Weebly editor in a new browser tab. 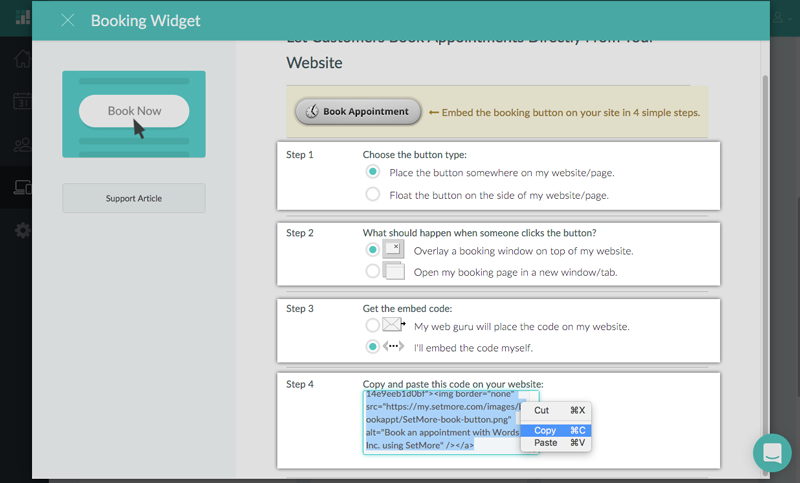 In your Weebly toolbox, find the option for "Embed Code" and drag this field into your website where you would like the "Book Appointment" button to appear. 4. Click on the field to edit the code, then paste the HTML code that you copied in the previous steps. 5. Save your changes and publish your website. Once you complete the integration and reload your Weebly page, you should see the "Book Appointment" button on your website, and clicking the button will open your Setmore Booking Page. Congratulations, you can now take appointments online! You can choose to have the "Book Appointment" button float on the side of the visitor's browser window, or appear in-line with your website's body content. You can choose to have the Booking Page open in a lightbox (a window that hovers in the current browser tab), or open in an entirely new browser tab. These options are all accessible under the "Booking Widget" integration card. We'll cover how you can access these options below. 1. Navigate to Apps & Integrations, then scroll down to the Integrations section and click the Booking Widget card. In Step 1, you can choose to place a button in-line with your website content, or you can "float" a button on the side of the user's browser window. If you're unsure of what to do, simply choose the first option to place a button (we don't mean to play favorites but it's the best one). In Step 2, you can choose to have the button open your Booking Page as a pop-up window, or in a new browser tab. 3. For Step 3, select "I'll embed the code myself." 4. In Step 4, the form fields will change to display a section of HTML code. Select and copy all of this code. 5. Open Weebly in a new browser tab. Repeat steps 3 through 5 from the preceding section in this support article.